Recently I picked up this striped tee on clearance at Old Navy, and it has quickly become one of my favorite tees -- mostly because it reminds me of the tees that I'm drawn to on Pinterest. If you were to have a peak into my wardrobe you would discover that I own several striped tees. What can I say? They are classic wardrobe piece that can be styled a million different ways! Oh, yes! The strawberries pictured above are from our garden. In fact, I had just finished picking them before working on this post. I don't know about you? But, I adore freshly picked strawberries -- especially with some ice-cream or angle food cake & cool whip. Yum. Well, I better get going, as I have to get ready to leave for my sister's softball game. Talk to y'all later! 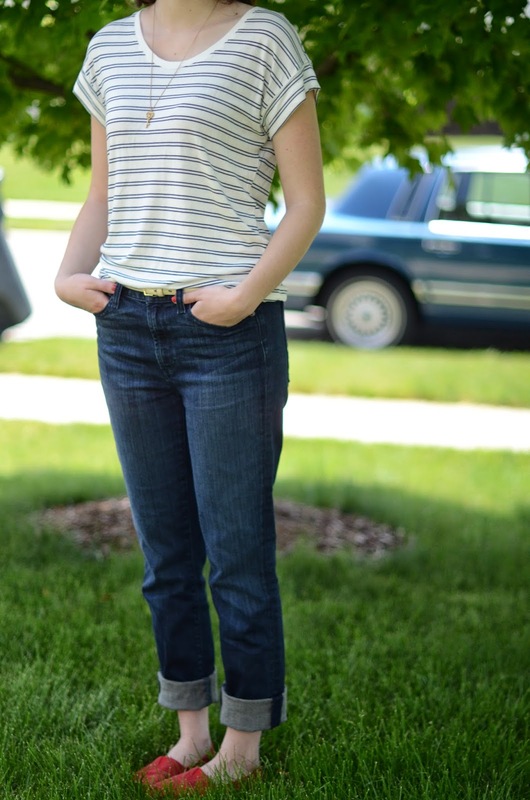 I found one of my favorite stripe shirts on clearance at Old Navy too :) Lovely outfit! That is so cute! I love the tee shirt and the little "pops" of red! It looks great together and you look lovely! Congratulations to your sister, Abby! Ashley, your style has evolved so much since I started reading your blog! This is such a cute outfit, by the way. Casual chic. Fun outfit! I like how it's sort of nautical and patriotic. :) The strawberries look yummy too! Aw! You look so cute! I love the casual, vintage style of this outfit. And the pops of red are gorgeous!